Start of Titanic Project week 2 and the Crew were working with Mr Weir from Art and Design creating Titanic posters in Photoshop (photos to follow). Next they learned about buoyancy and how enormous steel vessels stay afloat, making their own vessels with Mr Law in Science. Congratulations to the team of Omar and Conor whose boat was most successful. In the afternoon, Miss Moir from Social Subjects worked with the class on a giant map showing the Titanic’s route from Belfast to disaster, adding information about each port of call and passenger nationalities. On the 22nd February the S5/6 Travel and Tourism class enjoyed a visit to Edinburgh Airport for the day. The pupils were shown around various departments by Jamie Loudon and his colleagues at British Airways. The day started with a briefing from British Airways staff before heading to security to learn how they check luggage. Pupils were shown into a security room and talked through the bag checking process. After that, pupils were taken behind the scenes to see where all the baggage goes and how it is separated for the different flights. Pupils then got to enjoy lunch in the British Airways lounge before being taken on a tour of the runways by bus. After that there was time for a quick chat with the firemen at the fire station and some air stewards on a British Airways flight before heading home. 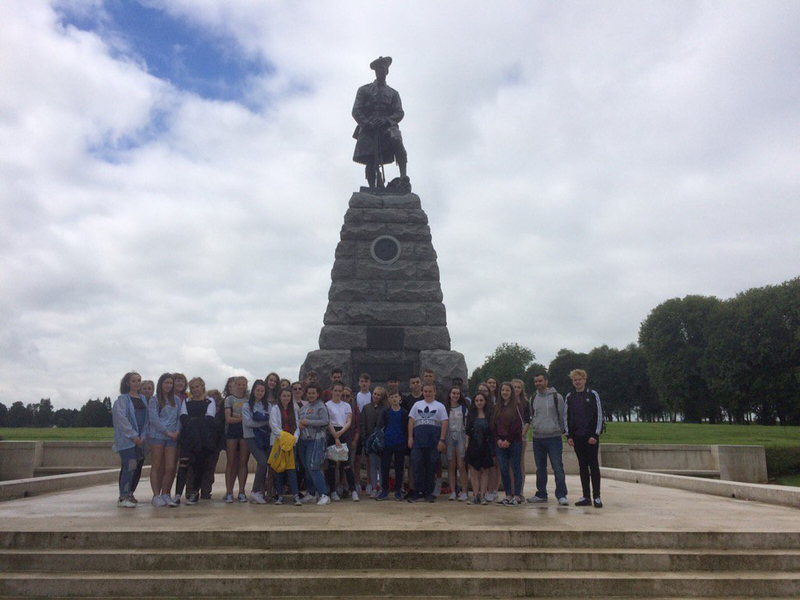 The class would like to thank Jamie and his staff for taking the time to organise the trip and showing us around on the day. The pupils thoroughly enjoyed the experience and gained a valuable insight into working in an airport. Thank you to everyone who participated in the #ReadyToVote campaign in OLHS. All pupils that will be aged 16+ on 4th May should now be registered to vote. If you missed out on our registration sessions then pop along to my class at lunchtime and I can help you get organised. The Higher Geography class visited Glasgow on Monday 20th March to conduct fieldwork for their assignment. The class visited the suburbs, the inner city area and the city centre to carry out their work. Pupils completed traffic surveys, recorded different land uses in the areas and conducted questionnaires to the public. Pupils are now working hard in class to process these reuslts and analyse them for their assignment. Every pupil did a fantastic job of representing the school and thoroughly enjoyed their day out! The S5/6 Travel and Tourism class had a guest speaker this week. Jamie Loudon is the airport manager for British Airways at Edinburgh Airport. Jamie spoke passionately about his job and his career so far. The pupils enjoyed his stories from his time as an air steward and had the opportunity to ask questions about the travel industry. The class woud like to thank Jamie for taking the time to talk to them and for all his advice he gave them for the future. S3 Modern Studies pupils visited Summerlee on 18th December as part of UK Parliament Week. They were addressed by Phil Boswell MP, Elaine Smith MSP, Councillor Michael McPake and Professor Kirstie Blair from Strathclyde University, as well as exploring the exhibits throughout the museum, and taking part in a mock election for the Scottish Parliament and in the EU Referendum. Pupils pointed out to Mrs Macfadyen that cameras were not allowed in polling stations, but graciously agreed to allow shots without faces in view. 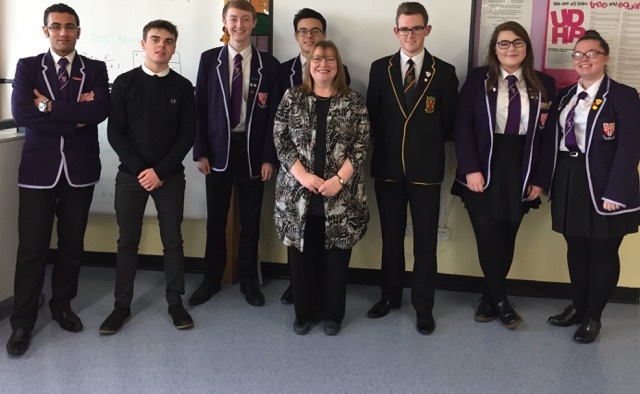 Clare Adamson, MSP, visited our Higher Politics class this week. Clare led discussion on various topics, including the European Union and her own journey into politics. We are very grateful for the time she spent with us and the knowledge gained. This experience will undoubtedly help our young people as they progress through their studies. Our Higher Politics class also helped write a speech on ‘The State of Mortuaries in Scotland’ for Graham Simpson, MSP. Mr Simpson delivered his speech in Parliament and our young people watched the recording of this on YouTube. We are proud of their hard work. You can see the speech below (blocked within NLC authority schools). We would like to thank Mr Simpson for this opportunity and we look forward to visiting him in Parliament. 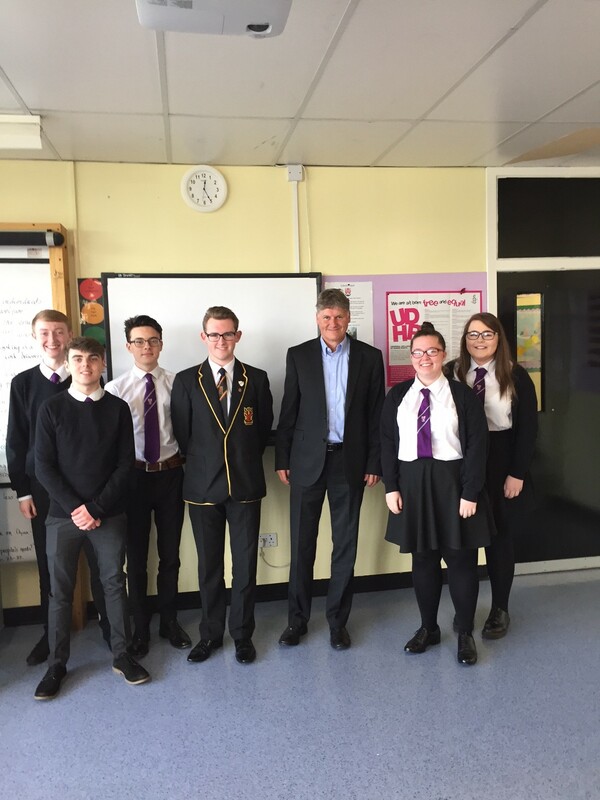 Colin Fox, National Co-Spokesperson for the Scottish Socialist Party, visited our Higher Politics class this week. Colin led discussion on his own understanding of socialism as a political theory, socialism in action in modern Scotland and counter arguments in response to criticisms of socialism. We are very grateful for the time he spent with us and the knowledge gained. This experience will undoubtedly help our young people as they progress through their studies. The Travel and Tourism class visited Thomas Cook in Motherwell to find out about their demands of working as a travel agent and their customer service policy. We spent a really interesting hour in the store chatting to the staff and asking questions about a wide range of issues related to meeting the needs of customers and how to pursue a career in tourism after leaving school. S6 pupils successful in their application to go to Auschwitz are Ross Walker and Zoe Law. They will go on a one day visit to Poland on 28th September with the Holocaust Education Trust. They will, we are sure, have a thought provoking and memorable visit. Twelve of our Higher Modern Studies/Higher Politics pupils represented our school at the North Lanarkshire Council International Conference on Thursday 16th June. 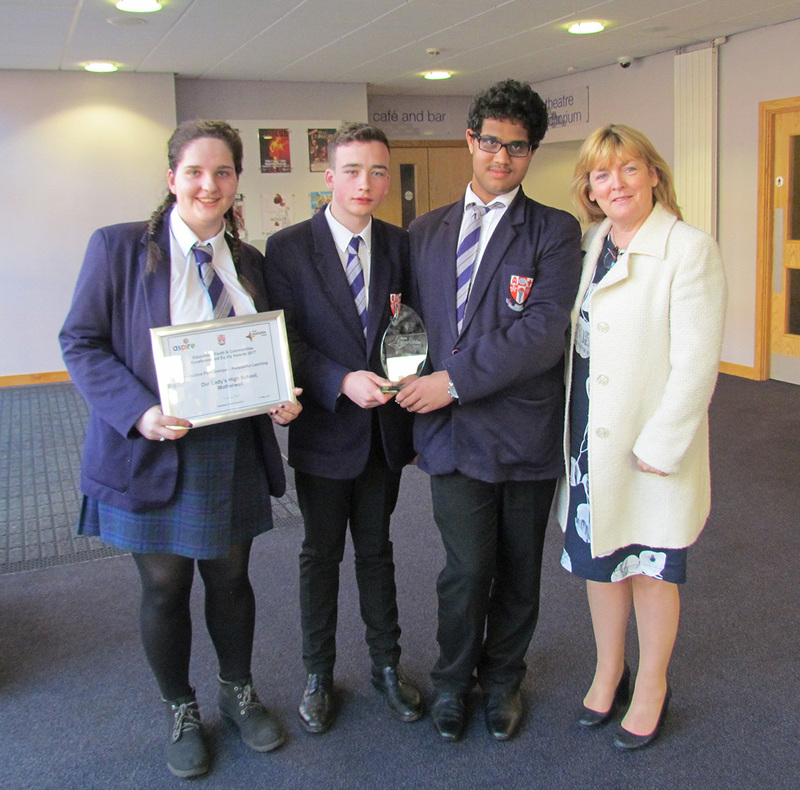 Our pupils took on the role of diplomats and debated with over 250 other pupils. This opportunity allowed our young people to recognise the power of deploying rational and reasoned arguments which are rooted in reliable and compelling evidence. They passionately represented Syria and are a credit to our school. Furthermore, Magen McNulty won the award for “Best Contribution” on the day and has made us all extremely proud. Pupils took part in a whole school mock European Union Referendum on Friday 17th June. It will be very interesting to see how our result compares to the outcome of the official referendum that takes place this Thursday 23rd July. On the 1st and 2nd of June this year, over 100 of Our Lady’s High School students visited the New Lanark World Heritage Site. Just under 100 S1 Science pupils along with some S3 Geography students experienced learning about the history of the Mills and their use of renewable energy. There was a very clever use of gravitational potential energy, as water flowed from the lade (a canal that was cut parallel to and higher than the Clyde) down through the water wheels of the Mills and back into the Clyde. The cogs, ratchets and gears that then transferred this free energy into working the spinning machines helped make New Lanark such a success story. The social history tour helped put the science into context. The village that supported the mills had their own shop, church and doctor under the direction of mill owner, Robert Owen. Although the working week was long and more arduous than the vast majority of jobs in the UK currently, it was a vast improvement upon that experienced by many of their contemporaries. They even had a school where children could receive “free” education until their teenage years! With Sunday off each week, a couple of extra days off during the year, a shop that sold quality produce at cheap prices and pleasant countryside to walk through, it must have appeared a dream employment for many ordinary working people. Our pupils were very well behaved and a credit to our school and thoroughly enjoyed themselves while learning science, geography and history. A beneficial synthesis for learning! Thanks go to all our tour guides from the New Lanark Trust and especially to, “Historic Environment Scotland”, for their travel subsidy. Pupils are getting ready to vote in the upcoming Scottish Youth Parliament by-election for Motherwell and Wishaw. Christopher Wilson from the school is standing as a candidate and we are extremely proud of his hard work. Young people will have the opportunity to vote in Our Lady’s High School next week.